Vinsic 28000mah Power Bank Ultra Slim External Battery Portable Quick Charger. Model VSPB402 (In Very Good Condition) Item was tested and works. USB Output / Micro USB Input. It is perfect. For quality, you can trust and rely on, look no further. 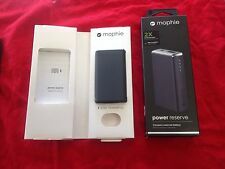 Capacity of Power Bank: 20000mAh. With this power bank at hand, you can say proudly "no problem" to your friends whenever they want to share the power bank with you, without thinking about what charging ports their phones support. VINSIC Model: VSPB202. Feature: Vinsic Exclusive Design. Is LED Lamp Illumination: No. Battery Capacity(mAh): 15001-20000mAh. Supports Solar Energy: No. Output Interface: Double USB. Model Number: VSPB202. RAVPower 26800mAh Power Banks. 1 x RAVPower 26800mAh Power banks (Model: RP-PB41) 2 x Micro-USB Cable 1 x Travel Pouch 1 x User Manual. When dealing with this much power, you're going to need a bit of protection. 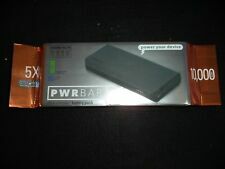 PWR BAR FOR YOUR DEVICE. PWR Bar 10,000 mAh Micro USB Power Bank, Black (black). FEED THE NEED FOR CONTINIOUS POWER. Compatible with all iPhone, iPad, iPod models. Bluetooth audio. Trending at C $18.97eBay determines this price through a machine-learned model of the product's sale prices within the last 90 days. Micro USB to USB charging cable. Stay connected wherever you go with this power bank's 10,000 mAh capacity. Compatible with most devices equipped with a micro USB port. 10,000 mAh capacity provides plenty of power for charging your devices.